Cloud applications continue to gain momentum in enterprise applications as buyers are attracted to fast deployment speeds, low upfront costs, and ongoing flexibility to scale up or down as needs change. But as firms spend more and more of their closely guarded IT dollars on cloud applications, executives must scrutinize the long-term value of these investments. Today's cloud investments represent millions of dollars of annual IT spending for some larger consumers of cloud. 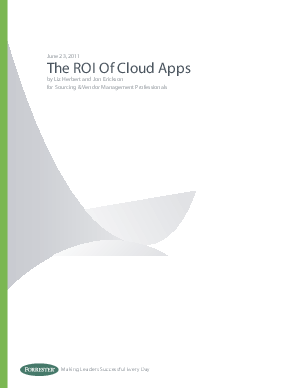 This report analyzes the longer-term, five-year cost of ownership and value for cloud applications across four categories: customer relationship management (CRM), enterprise resource planning (ERP), collaboration (including email), and IT service management.